Our Nobel Prize winning science behind our BioPhotonic S3 Scanner represents a culmination of over 15 years of research and development at a cost of over $150M. It is the only patented instrument that in 30 seconds conducts a live non-invasive tissue measurement and provides an immediate personal antioxidant assessment. What does that mean for you, your clients and employees? In just 30 seconds you can get a crystal clear reading of the bodies internal plumbing and if its working healthily or if there is work to be done to ensure you live a healthy life from the inside out! The BioPhotonic Scanner has been in use with more than 17 million scans performed worldwide since 2003, the BioPhotonic Scanner has revolutionised the way we can look at our health. Developed by scientists and doctors at a top U.S research university, the scanner is the world’s first and only clinically proven tool that measures carotenoid levels non-invasively in living human tissue. The main question is …Do you take supplements, vitamins, juices etc and how do you and your clients/employees know your nutritional supplements are really working and are they making a difference to your actual health? You may be super fit, the picture of absolute health on the outside but do you really know how healthy your inside body is? 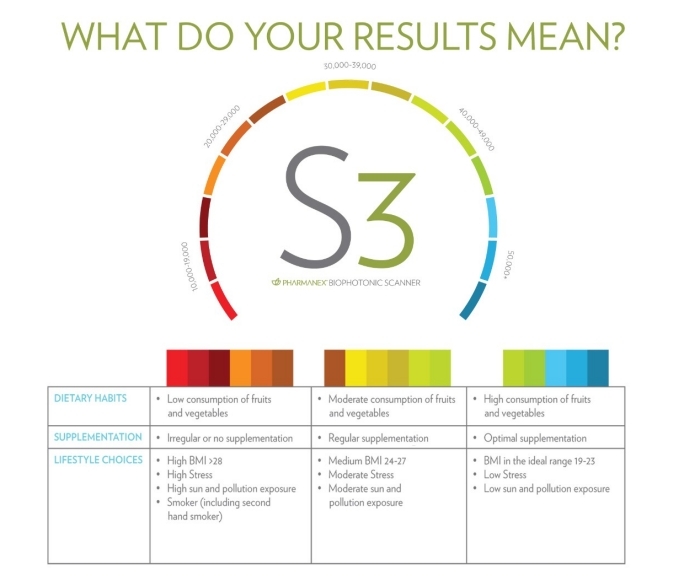 We can provide the answer = The NEW S3 Pharmanex® BioPhotonic Scanner! 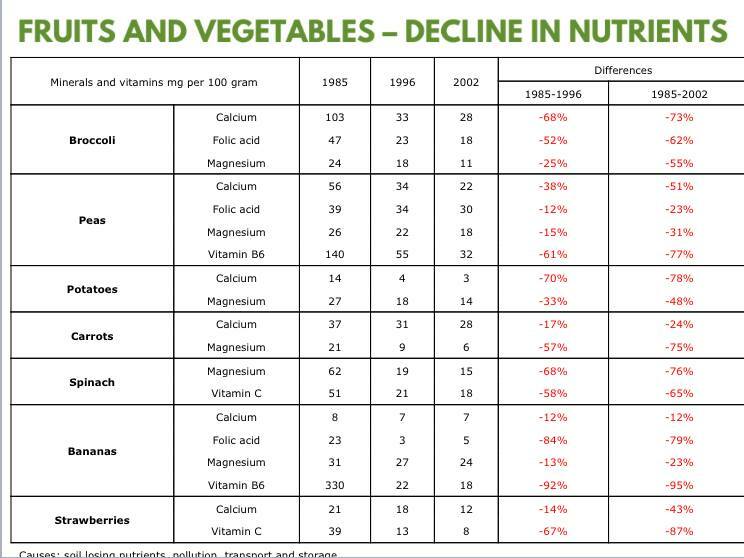 Science has proven we cannot get the quality from the land now and the rise in disease and life threatening conditions has a direct correlation to our diet and inner health. Now we have to ensure we have a healthy diet consisting of a good balance of Macronutrients and Micronutrients. With our fruit and veg depleting in essential goodness we have to look to supplementation in some cases to assist our bodies and lifestyles. You always have to start with fresh produce but now with the guidelines of 8-15 portions daily it is very rare individuals and families can either afford, have time or consume this on a regular basis. Simple solutions can be the difference to how long we are on this planet and the quality of life we have as we age. Why introduce our health body scan in your place of work? In short we have to do something to relieve the pressure on the NHS, in fact it is actually important that we take charge of our own health in the form of prevention as sometimes when we finally get to the NHS treatments, sadly for some it may be too late. As stress, anxiety, depression, cancers, dementia, cataracts and so many more illnesses are on the up there is a reason for that. As a nation the exposure to oxidative stress from pollution, processed foods, drinking, smoking, personal stress and many more attack the body over 70,000 times a day. No wonder our health has suffered! It’s time to take charge and live a longer, more vibrant version of you! In call centres one of the biggest concerns is staff sickness from common colds, flus etc that are easily transferred from person to person. Working in a close environment it is key that staff have a good immune system to fight the risks of these bugs. It not only will help the employer with less staff sick days but will protect the member of staff at work and at home. Know you are doing what you can for your employees – Only a few years ago an employee had lied on his job application in the health section even when he had previously fainted while working as a bus driver and had failed to disclose it. Killing 6 people behind the wheel of a lorry it was then found out he had made more than 300 visits to doctors and GPs since 1976 with a number of issues being raised including dizziness, persistent headaches, anxiety, vertigo and depression. It later emerged during court proceedings that he had lied to his current employers about his medical history of having blackouts. If you employ people who work machinery, drive for work, have high levels of sickness rates, stress on the increase etc we can help with regular 4-6 week scanning. We work on behalf of your company but also offer a health guide to your employees to make them take charge. All our scans are strictly confidential between the scanner operator and the scan client. However in some cases by implementing a scan health program you can receive tax relief and also negotiate more favourable insurance rates. This add on is easy and perfect for workplaces of all sizes, Healthcare professionals, consultants, Fitness, Dancing and Wellness Professionals. We offer a Turnkey Total Wellness Program with Lifetime Monitoring that includes not only the measurement device but also the only clinically proven solution with nutritional therapies listed in the PDR and guaranteed to work! You can choose for us to fully manage your program or choose to add this business into or run alongside your current business and potentially add thousands of pounds, dollars etc per year to the bottom line of the your practice, dance school, fitness business while improving your clients/employees overall wellness. This 30 second scan helps you by delivering big results! Get started today and offer the world’s most advanced, science-based anti-aging scan, without any commitment to the supplements available. Pharmanex is the only nutritional supplement company that can provide you with a non-invasive, accurate, fast and convenient way to determine your patients antioxidant status – and whether the supplements are actually providing adequate levels of protection for your patients/clients/employees. NSE was awarded a 2005 American Business Award at the annual American Business Awards ceremony in New York City on June 6, 2005. NSE won the award in the Most Innovative Company category for the Pharmanex® BioPhotonic Scanner. The award was given in recognition of the Scanner for the Most Innovative Company among contenders with more than 2,500 employees, competing against other finalists like Oracle Corporation and PACCAR Inc. The previous year’s winner in the same category was United Parcel Service (UPS). NSE was recognised among other top companies that included AT&T, Procter & Gamble, Sprint, and Intuit and was the only direct selling company to receive a 2005 American Business Award. Scientists believe free radicals contribute to the aging process. It’s a fact of life … we age, every second, of everyday. And although we can’t stop the aging process, we can take steps to improve our health as we age. Certain known causes of free radical damage such as smoking or sun exposure can have negative impacts on how we look and feel. Pollution, exposure to toxic chemicals – even the air we breathe creates free radicals within our bodies. 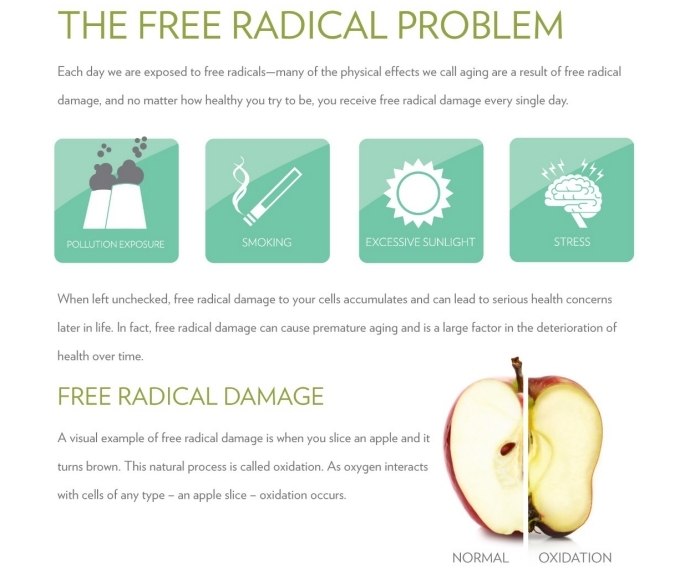 Why should we be concerned about free radicals? Free radicals are highly reactive, short lived molecules that can damage proteins, fats, and even DNA inside of our bodies. Every day our cells get about 75 thousand free radical hits to their DNA. Most of the damage can be repaired by repairing enzymes inside the body, but the little bit of damage that can’t be repaired accumulates over time and can add to the problems associated with the normal aging process. There are many different kinds of antioxidants and they work together to help fight the harmful effects of free radicals. Our bodies produce some antioxidants and other important antioxidants are consumed in our diets. All of these antioxidants work together to form a powerful system to support good antioxidant health. 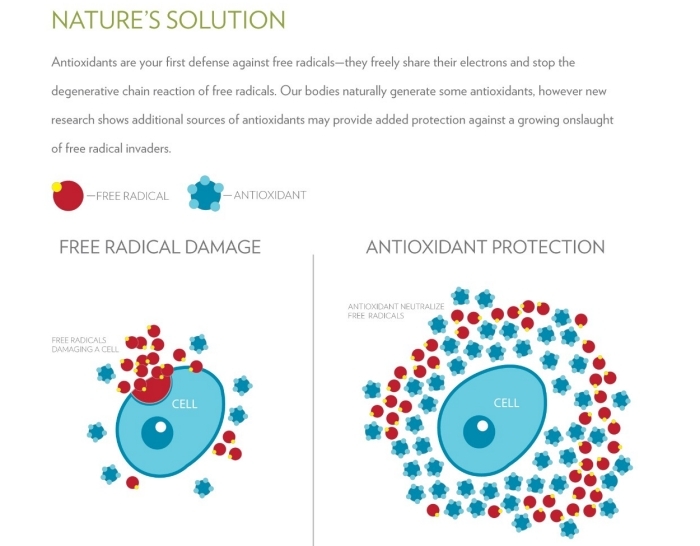 Antioxidants can actually capture or neutralize free radicals and therefore stop the chain reaction. One of the most powerful classes of antioxidants is carotenoids. 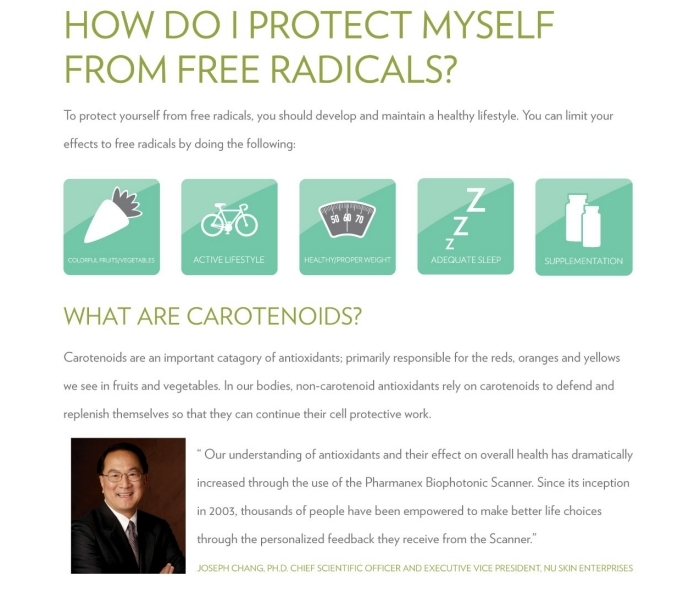 Carotenoid antioxidants can help break the chain reactions of free radical damage. That’s why it’s important to get measured and know your Pharmanex® Antioxidant Score. After your initial measurement, you can take steps to raise your antioxidant levels by eating properly and by taking supplements. By supplementing your diet with LifePak® and being scanned every 60 days, you will now be able to track your body’s antioxidant score and determine if LifePak® is helping to improve your antioxidant level. The Pharmanex BioPhotonic Scanner uses the Nobel Prize-winning science of Raman spectroscopy to detect the concentration of carotenoid antioxidants in the skin. Over 50 peer-reviewed articles have been published by independent research groups around the world which validate the use of Raman spectroscopy for the measurement of carotenoids in the skin. Nu Skin owns the patented and exclusive rights to the use of Raman spectroscopy technology in this field for commercial applications. Over 17 million people in more than 50 countries have been scanned by the Pharmanex BioPhotonic Scanner. We believe that after almost a decade of experience and extensive validation studies of the Pharmanex BioPhotonic Scanner utilizing Raman spectroscopy it is the most reliable and accurate non-invasive scanner of carotenoids. Our research validates a highly correlated indication between carotenoid antioxidants and overall antioxidant status. When you think of the new S3, think in terms of the scanner being smaller, faster, battery-powered, and integrated with iOS wireless capability. Pharmanex’s mission is to help people build healthier, more productive lives by creating optimal nutritional supplementation. Nu Skin Enterprises, Inc., incorporated on September 4, 1996, is a global direct selling company with operations in 53 markets worldwide. The Company develops and distributes anti-aging personal care products and nutritional supplements under its Nu Skin and Pharmanex brands, respectively. The Company markets a variety of products under its Pharmanex brand. LifePak, its line of micronutrient supplements, represented 13% of its total revenue and 26% of Pharmanex revenue in 2012. Other anti-aging nutritional supplements include its ageLOC R2, which is designed to renew and recharge the body. Pharmanex measures every aspect of its science. We measure the health benefits of our products through clinical trials. We measure the levels of active ingredients through standardisation. We measure safety by determining levels of toxic contaminants. We measure the consistency of our manufacturing process. And we have the exclusive ability to measure carotenoid antioxidants in the body using the Pharmanex® BioPhotonic Scanner. All these activities are captured in the Pharmanex® 6S Quality Process, which is the standard for the industry. Pharmanex is a global leader in nutritional supplementation. With more than 125 staff scientists and extensive global scientific resources and relationships, Pharmanex has created a worldwide network of knowledge and intelligence unprecedented in the industry. Our world-class team, utilising world-class processes, brings you a line of absolutely safe products that absolutely work. In 2009, the Nu Skin and Pharmanex labs in Provo, Utah, were renamed as the Nu Skin Enterprises Centre for Anti-Aging Research. The facility’s new name reflects the company’s commitment to focus on developing anti-aging science to incorporate into both personal care and nutritional products. This important research facility is one of three global research centres and houses nearly 50 scientists and $1.75 million of equipment. A vital resource for fostering collaboration and scientific breakthrough, we believe this state-of-the-art institution fortifies Nu Skin’s position as a leader in anti-aging science. As the company continues to develop comprehensive health and skin care solutions for the anti-aging industry, the Nu Skin Enterprises Centre for Anti-Aging Research stands as a beacon of innovation and integrity, setting the standard for others to follow. An expanded research and development space for the Nu Skin Enterprises Center for Anti-Aging Research with a total of 18,000 sq. ft. The Pharmanex Beijing Clinical & Pharmacology Center is actively engaged in research to determine the pharmacology-toxicology, the clinical benefits, and the mechanisms of the clinical benefits of natural products. Established in 1996, the Pharmanex Shanghai Research and Development Center was originally located in modern state-of-the-art laboratories on the campus of Fudan University. In 2002, Pharmanex’s first research and development facility in China was relocated to the Shanghai Zhangjiang Hi-Tech Park. The center occupies 12,000 square feet of lab and office space and is staffed with 33 research scientists, more than half of them are PhDs and MSs. The center is responsible for information and intelligence analysis, natural product chemistry, manufacturing process development, and analytical science in support of quality assurance. The center is directed by Dr. Min Li, one of the most prominent medicinal natural product scientists in China. David J. Bearss, Ph.D. Lars Bohlin, Ph.D. (Pharm) Paul Alan Cox, Ph.D. Carl Djerassi, Ph.D. Zoe Diana Draelos, M.D., F.A.A.D. Georges Halpern, MD., Ph.D. Makoto Kuro-o, M.D., Ph.D. Lester Mitscher, Ph.D. Koji Nakanishi, Ph.D. Lester Packer, Ph.D. Tomas A. Prolla, Ph.D. Hildebert Wagner, Ph.D. Molly Wanner, M.D., M.B.A. Richard Weindruch, Ph.D.
“After having covering the many recent bankruptcies and corporate scandals, Forbes wanted to find and recognize the ‘most transparent and trustworthy businesses that trade on American exchanges.’ To do so, the media outlet hired an independent financial analytics company, Audit Integrity, to identify the top accounting and management practices in the country.” “The financial analytics company screened 8,000 companies traded on U.S. exchanges and found 100 companies that ‘consistently demonstrated transparent and conservative accounting practices and solid corporate governance and management.’ Company’s performance on Wall Street were also taken into account for the ranking.